This article was originally published in PC Gamer issue 301. For more quality articles about all things PC gaming, you can subscribe now in the UK and the US. Spoilers follow for the end of Pillars of Eternity. At the end of Pillars of Eternity, after slaying Thaos and restoring the natural cycle of life and death to the Dyrwood, the Watcher settles down in their stronghold of Caed Nua. But any hopes of a peaceful life are dashed when, in the cavernous dungeons buried deep below the fortress, the god Eothas awakens. The deity, who has taken the form of a gigantic stone titan, breaks free. Caed Nua is destroyed and the Watcher is badly injured. But they manage to survive and so begins a quest for vengeance as our hero travels to the exotic Deadfire Archipelago in pursuit of the rampaging god that destroyed their home and left them for dead. 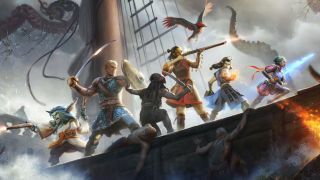 Deadfire is a direct sequel to Pillars of Eternity, the crowdfunded RPG that took the best bits of classic Infinity Engine games like Baldur’s Gate and Planescape: Torment—deep systems, rich worlds, reactive stories—and confidently retooled them for a modern audience. You are, once again, the Watcher: an individual who’s blessed (or cursed, depending on who you ask) with the ability to look into people’s souls and relive the past lives of their ancestors. The character you created in the first game can be imported, or you can make a new one. The ragtag islands of the Deadfire Archipelago are scattered across a great expanse of ocean spanning thousands of miles. The ragtag islands of the Deadfire Archipelago are scattered across a great expanse of ocean spanning thousands of miles. Some of these islands have been inhabited for generations by indigenous tribes, or have recently been colonised by foreign explorers. But many remain uncharted, home to rare treasures, forgotten dungeons, and fell beasts. Developer Obsidian (Knights of the Old Republic II, South Park: The Stick of Truth) is promising a variety of terrain, including lush jungles and barren deserts: a far cry from the temperate forests of the Dyrwood, which was a fairly typical fantasy setting in most respects. And, as you might expect, seafaring is a big part of Deadfire. To get around you’ll need a ship, and the Defiant is the Watcher’s first vessel: a small craft with just enough cannons to defend herself from anyone looking for a fight, and the floating equivalent of your stronghold in the first game. In the lawless Deadfire Archipelago, which is like a watery Wild West, someone is always looking for a scrap. Pirates roam the seas, looking for passing ships to plunder or just blow out of the water for sport. This is the thing that really sets Deadfire apart from its predecessor. As well as the traditional RPG stuff you’d expect from a Pillars game, you’ll also be spending a lot of time at sea, exploring, travelling, and trying not to end up as a pile of smouldering driftwood. When you undock, you find yourself on the world map. It’s here where you control your ship, clicking on spots of ocean to move around. And when you see an anchor symbol on the coast of a landmass, that means you can stop there. It might be a lifeless desert island hiding a quest or dungeon, or a village like Tikawara. This idyllic settlement is home to the Huana, an aumaua tribe whose ancient way of life is being threatened by the arrival of explorers from the Vailian Trading Company; an analogue of the real-world East India Company. It’s here where you encounter one of the many moral quandaries Deadfire throws at you. Disembarking from my ship, I meet a concerned-looking man called Vektor on a wooden dock. Noticing that I’m a fellow mountain dwarf, he seems relieved. “How long I waited for a familiar face in this friendless hovel!” he exclaims, eager to share his predicament. He tells me he sailed to Tikawara with the Vailian Trading Company on a search for luminous adra, a semi-precious stone that grows from the ground in Pillars’ world. But the crew disappeared while investigating a nearby island to the east, Poko Kohara; an island Ruãnu, the village chieftain, tells me is beset by strange, otherworldly storms that are driving visitors away. The village is an example of Deadfire’s distinctive atmosphere and art direction. Around me I see immense wooden carvings of seabirds and angler fish: a reflection of the Huana’s close connection to the sea. Their huts are carved with intricate patterns and painted in bright colours, reminiscent of ancient Polynesian art. It feels like I’m a million miles away from the Dyrwood, which makes the setting seem more exotic and alien. I also get a brief glimpse of the new dynamic weather effects when a heavy rainstorm sweeps in, soaking the village—weather that will undoubtedly make your life at sea even more of a trial. Ruãnu welcomes explorers like the Vailians to Tikawara, because he thinks trading with them will bring prosperity to his people. But Nairi, the priestess, thinks they threaten their way of life, and will end up exploiting or enslaving the Huana. And so it falls upon you to make a choice. Do you clear the storms, making Tikawara an appealing port for explorers again? Or do you side with Nairi and destroy the adra so they have no reason to visit this part of the archipelago? You can wade in and make a decision, changing the lives of these desperate islanders forever. Or you can just sail away and leave them to their troubles. It’s a moral predicament that’ll be familiar to anyone who played the first Pillars of Eternity, or any of the BioWare/Black Isle games it shares its DNA with. The Watcher has a nasty habit of getting tangled up in people’s lives, and it seems things are no different in the Deadfire Archipelago. This place is as troubled as the Dyrwood, and it’s interesting to see Obsidian exploring themes of colonisation and self-determination. It’s clear the setting draws from real history, particularly colonialism in the South Pacific in the 19th century, and I’m curious to see the resulting storytelling with that subject matter. Will a Watcher navigate choices around exploiting indigenous peoples like the Huana for their own gain? Freedom of expression is a big part of the Infinity Engine lineage of RPGs, and Deadfire is no different. The Watcher doesn’t have to be a hero, and there are plenty of ways to cause trouble in the archipelago. As well as pirates you’ll see defenceless merchant ships on the world map, and you can attack and loot them if your black heart desires it. But repeatedly sinking civilian ships will give you a bad reputation, which isn’t necessarily a bad thing. Being known as a fearsome pirate could probably come in handy if you need to squeeze some information out of someone. But it could also cause you problems if you encounter a faction whose ship you sent plummeting to the bottom of the ocean. Your success in a ship battle is also determined by the experience of your crew. Throughout the game you’ll meet sailors who can be recruited, and they’ll each have different skills. One might be an experienced helmsman, but is no good at manning the cannons. Another could be a hell of a surgeon, but next to useless when placed at the wheel. You manually assign roles to these sailors based on their area of expertise, but sometimes you’ll be forced to place an inexperienced crewmate into an unsuitable role. You’ll need to monitor their morale, too. If you’re feeding them fruit and wine they’ll be happy, but if supplies are low and all you can offer is water and hardtack, they could disobey your orders or, worse still, stage a mutiny. It’s like spinning bearded, tattooed plates. These systems combine to give ship combat something approaching the depth and complexity found in regular combat—and things only get more layered when you buy bigger ships and have more roles to fill. Attacks have a random chance of killing your crew members during a battle. So if a well-placed shot from your opponent wipes your helmsman out, you’ll lose the ability to move. And if you replace him with someone inexperienced such as the ship’s cook, for example, your speed and manoeuvrability will be severely reduced. It’s quite unlike anything else in the original game, and reminds me a lot of games like FTL: Faster Than Light or Sunless Sea. These systems combine to give ship combat something approaching the depth and complexity found in regular combat—and things only get more layered when you buy bigger ships and have more roles to fill. But director Josh Sawyer reassures me that, if you’re not big into the ship combat, it’s possible to finish the game with the default Defiant. This is an elegant way of representing naval combat, rather than trying to make it occur in real-time, which Pillars’ engine just wasn’t designed for. Wind was originally going to be a factor, but Sawyer decided it simply wasn’t fun having to manage that on top of everything else. Obsidian is still refining the system and it may change again before the game releases, but what’s in place now is a fine way of getting across the idea of fighting at sea. If you can’t be bothered trading cannonballs, you could always just get in close and board the enemy ship. Charge towards them and, when you get close, the game switches to its regular isometric view and you can leap aboard the vessel, fighting the crew and captain with your party. Some familiar faces will return to your party in Deadfire, including mild-mannered war veteran-turned-farmer Edér, volatile elven wizard Aloth, and feathered godlike paladin Pallegina. If you import a save, the relationships you cultivated with these characters will carry over; even if they were negative, of course. But there are plenty of new faces to recruit, including a few native to the Deadfire Archipelago. The relationships between characters felt slightly underdeveloped in the first Pillars of Eternity, and I’m glad to hear that more time is being spent developing them this time around. New party members include Xoti, a woman who fled to the archipelago to avoid the Saint’s War: a conflict Edér was involved in, which should open up some interesting dialogue. She’s a monk and priest, an example of the new multiclass system, which lets you combine the strengths of different classes. This should make character creation even deeper than before. Expect to spend a good 40 minutes creating your Watcher if you start fresh. There’s also Maia Rua, an aumaua ranger who travels with a bird of prey companion called Ishiza. She’s an experienced ship captain, a skill that’ll come in handy on the high seas. There will be other companions in the final game, but Obsidian is keeping the rest of the roster close to its chest. Rest assured, there’ll be plenty of oddballs to adventure with. If this all sounds a bit ship-heavy, don’t worry: there’s plenty of traditional RPG stuff in Pillars II, including wizards, dungeons, and dragons—whose skulls you can decorate your quarters with. While investigating an uncharted island I stumbled into a sand-blasted ruin guarded by an immense titan quivering with magical energy. So while it is indeed very big on pirates and sailing, it’s still fundamentally a fantasy game. And it won’t all be small, isolated islands either: Neketaka is a huge city and cultural hub where you’ll probably spend hours completing quests and talking to the locals. Deadfire is an enormous game, but Obsidian is making sure as much of it is as hand-crafted as possible, admitting there were too many combat encounters that felt like filler in the original.